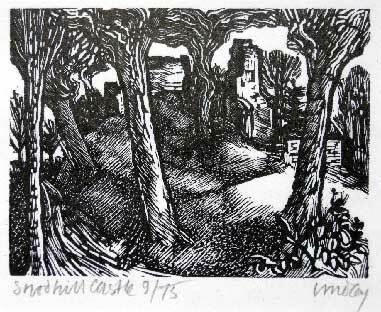 For such a large and important site, Snodhill Castle is oddly cloaked in mystery. As we start the first serious investigations of its history, we invite our Friends to be part of the discovery. Email your theories to info@snodhillcastle.org. Where does the name Snodhill come from? What does it mean? It’s been variously Snow hill, Snowdoun, Snoddehill, Snowdell, Snowdle, hill of the Snod, hill of Snot, Snathill, or, possibly it derives from the Old English ‘Snoed’ denoting a property of a manor. Some texts suggest it means either ‘bald hill’ or snowy hill. Bald maybe, but why snowy? What was on the hill before the Normans arrived? Behind the motte is a large at area and the whole hilltop is encompassed by various banks – an Iron Age hillfort? There are several of these nearby. Before the conquest, was a Norman castle built on the hill in 1050 to protect the prosperous but vulnerable Saxon villages of Mynydd Brydd, Dorestone, Wilmastone and Peterchurch? Was there a village at Snodhill in Saxon times? The valley beside the Castle is sheltered, well drained and fertile (an ideal place for a village). If there was a village here in Saxon times it appears not to have been recorded in the Domesday book – or was it? After all, there are many places named in the Domesday book in Herefordshire with no modern equivalent. Or was there another reason for its not being recorded? Was, for example, the west bank of the Dore off limits to the Domesday recorders? The possibility of a LiDAR survey of the valley and castle, and landscape investigations by Historic England, might throw light on this fascinating issue. In 1055 (according to Florence of Worcester), Earl Harold Godwinson’s army (that’s Harold of the Battle of Hastings) “Encamped beyond Straddell (at) Snowdon.” (‘Straddell’ is the old name for the Golden Valley.) Was ‘Snowdon’ actuallySnodhill? (Snodhill wascertainly called ‘Snowdoun’ in1302.) The army was apparently some15000 strong, and had been raised to repel the Welsh from Herefordshire after they burned down Hereford Cathedral. William Fitz Osbern built at least seven castles between Chepstow and Wigmore to keep the Welsh at bay. There’s a gap in this line between Ewyas Harold and Clifford Castle that Snodhill could exactly fill. Did he build (or rebuild) the castle in 1068 as part of his campaign to secure the border with Wales? No-one seems to be able satisfactorily to identify the entrance to the castle; Where is it? What was it? A LiDAR survey may reveal more. The current architecturally unique 12-sided Keep was, we think, built around 1200. It apparently had three big windows at first floor level, which would have looked over the village, park and up and down the valley. Its stonework was of high quality, but not of serious fortified strength. Its enclosed space was compact; maybe floors were supported from a single central pillar? Was it a ‘tower’ keep or a very unusual ‘shell’ Keep? Snodhill’s ‘Royal Free Chapel’ had chaplains appointed by the King from 1287 through to at least 1540 but no trace of it remains. Robert Fayrfax, a popular composer in Henry VIII’s reign, was its chaplain from 1497-8. What happened to the building? Where was it? Rather than reinforce its weakest points, the Chandos’ built the enormous North tower on the castle’s strongest side. Why? 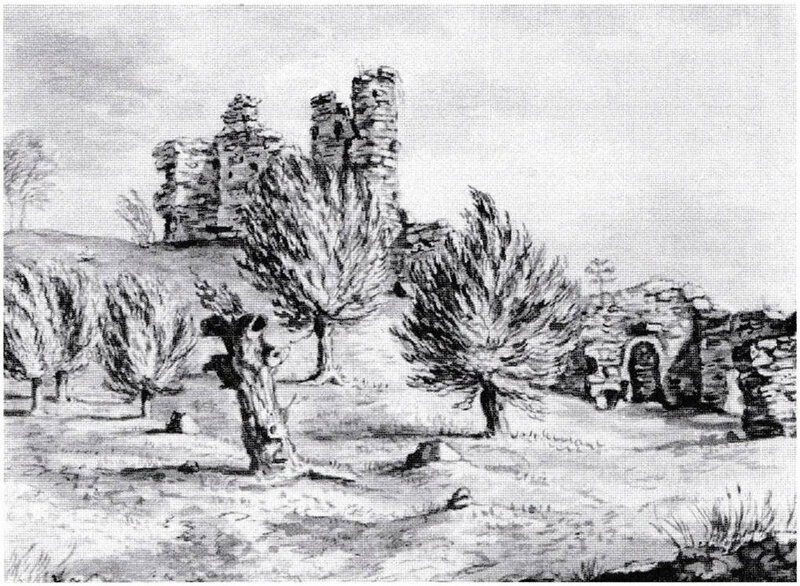 Why, if Snodhill Castle was even partially habitable (and described contemporaneously as ‘strong’) did King Charles I stay in a farmhouse near Arthur’s Stone and not at the castle, on the 17th September 1645? Was the castle besieged and destroyed in the Civil War, was it already abandoned or was it slighted later? 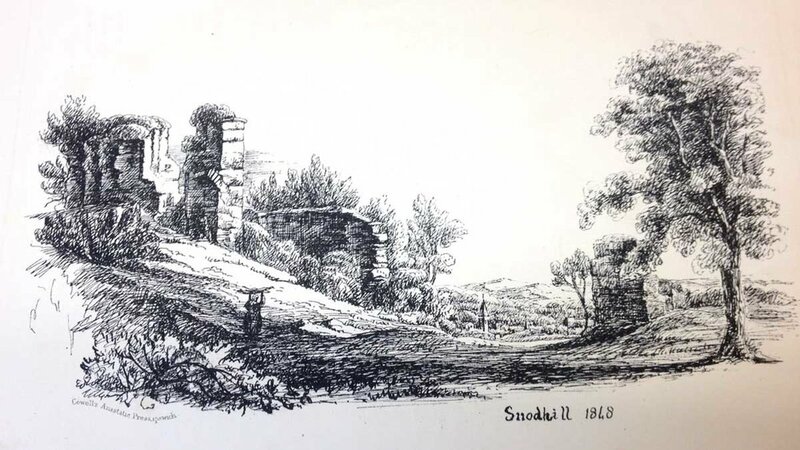 One of the many mysteries of Snodhill Castle is why such an obviously enchanting place seems not to have attracted hordes of colourists in search of the romantic. Here are three images of the castle from the last two hundred years or so…we’d love to see more; if you know of any, or have some snaps in dusty albums, please get in touch.